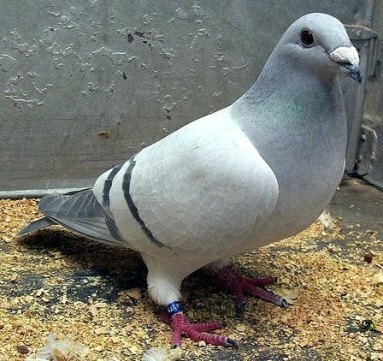 Yahoo News, December 8, 2012 -- In an unusual development that researchers are calling evidence of adaptive behavior, some catfish have taken to jumping on land to hunt live pigeons. 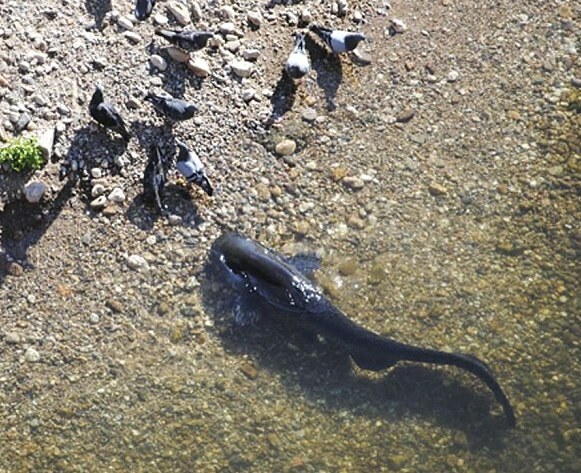 Discover Magazine's Ed Yong writes, "These particular catfish have taken to lunging out of the water, grabbing a pigeon, and then wriggling back into the water to swallow their prey. In the process, they temporarily strand themselves on land for a few seconds." 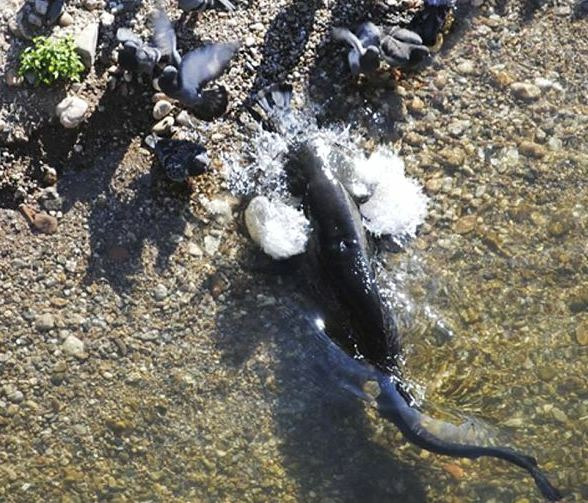 Researchers captured video of the European catfish, which reside in the River Tarn in southwestern France. 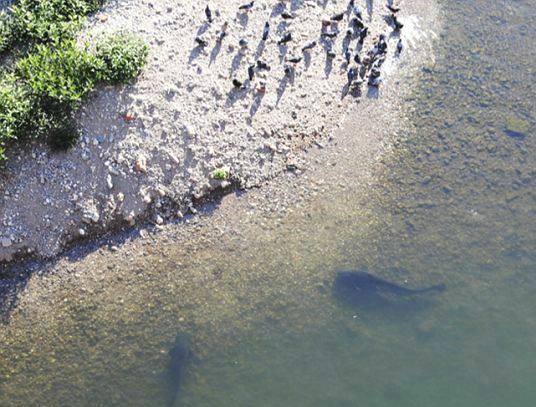 In the footage, several of the fish, which range in length from 3 to nearly 5 feet, are seen thrusting their bodies from the shallow banks onto land where they capture pigeons and drag them back into the water. Some dolphins and killer whales have exhibited similar behavior, though both are mammals and better equipped to survive on land for brief periods of time. 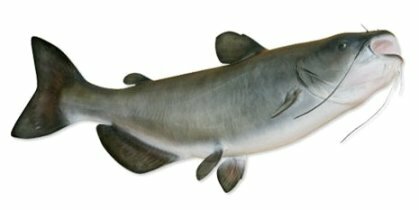 Still, Julien Cucherousset from Paul Sabatier University in Toulouse has taken to describing the catfish as "freshwater killer whales." The study results were published in the scientific journal Plos One. The study's abstract notes: "Among a total of 45 beaching behaviors observed and filmed, 28% were successful in bird capture. Since this extreme behavior has not been reported in the native range of the species, our results suggest that some individuals in introduced predator populations may adapt their behavior to forage on novel prey in new environments, leading to behavioral and trophic specialization to actively cross the water-land interface." HOW DOES A FISH EVOLVE TO HUNT PREY? Evolution is always on-going. Fish, just like terrestrial animals, are always seeking opportunities. Behavior is the way an organism responds to its environment. An animal’s survival depends upon its behavior. There are two kinds of behavior: innate and learned. Innate behavior comes from an animal’s heredity. An animal’s instincts are examples of its innate behavior. For example, migrating birds use innate behavior to know when to begin their migration and the route that they should follow. Learned behavior comes from watching other animals and from life experiences. By watching their mother, baby ducks learn how to avoid danger and to know what is good to eat. This is an example of learned behavior. It is theorized that catfish learn to hunt pigeons by watching other fish. Vision is an important sensory system for most species of fish. Fish eyes are similar to terrestrial vertebrates like birds and mammals, but have a more spherical lens. Their retinas generally have both rod cells and cone cells (for scotopic and photopic vision), and most species have color vision. Some fish can see ultraviolet and some can see polarized light.